This entry was posted in Skip Allen & Painter 12 and tagged Brush making, Cool Spring, Corel Painter 12 Class, Corel Painter 12 Tutorial Video, Corel Painter 12 Watercolor Brushes, Digital Art Academy, Free Corel Painter 12 Brushes, Skip Allen and Painter 12, Watercolor. Bookmark the permalink. WOW,,,was it ever worth getting up early this morning .. have downloaded the brushes and already viewed the first recording .. and will immediately view the second one. They are fantastic Skip and well worth the wait … and I can’t wait to start playing with them. I want to thank you so much for sharing your knowledge and your talent Skip .. and am looking forward to the class this month. Have fun with those brushes. I know you will do something special with them. I love seeing the different results from everyone. Oh boy !! They are finally here !! I stayed up late and watched and can’t wait to “play” !! They look fascianting Skip. Thanks so much for sharing them !! You are most welcome. Let me know what you think after you have had time to play. Skip thanks so much. Can’t wait to play with them today. You really are “magic” with your brush creations. We all really appreciate your generosity. Have fun playing with them today. It may take a minute or two to get used to them…I still feel clumsy with them. Let me know what you think after your play. Thank you so much for sharing these great brushes. I like the way you named them this time. It works with my left brain kind of logic. Skip, I was hoping to take your class in Oct., but my eye surgeries will interfere. Do you plan to have another one ? I was hoping someone would like the naming convention this time. Like I said in the video, it is so easy to rename them, and I hope folks will personalize them. Yes, the classes will repeat. The next sessions will start Jan 28, 2012. But Skip .. for any of us who will be taking your watercolor class .. should we perhaps wait and do any re-naming after the class .. so that when you use those brushes in the Oct. 22 class we’re all on the same page with names??? Hey, the old broad is already thinking about this class!!! LOL! Hmmmmm…good point, but I have mixed emotions about it. I will be using the basic names in the class, but I will not be telling you what brushes to use, but asking you to find particular types of brushes to use. You don’t need the names for that. For instance, I will be asking you to do several watercolor washes. Obviously, the smooth brushes can be washes, but so can the very wet, texture, fill and edge variants and to some degree the thick and thins. I don’t care about the name, I am just interested in you learning to handle a brush in a variety of ways…not just one way. Did I answer your question? Nope. I guess I don’t think it matters either way. Great question! These brushes look amazing. I will enjoy being in class and learning more about using them. I have just read your other comments and I must say the naming convention is interesting, I guess when you paint traditionally, you pick up either a flat brush or a round one or stubby one and proceed, in a way you have sort of done it that way, not limited a brush by its name, interesting! At some point I guess based on our own particular use we should develop a name for ease of use, but I am curious as to how this will develop. Either way, brilliant work maestro these look really good and I will look for you in class. Dean Tim had a hand in that naming issue…LOL. I think it will make more sense in the first week of class, but I am not going to spill the beans just yet. I am curious, too; I guess we will find out soon enough. I’m also curious to see how folks use the brushes. Everyone always puts a different spin on them and it is fun to see what develops. See ya in class…provided your day job doesn’t eat up all your time. This video was so informative! I have committed to practicing each day for at least an hour, played around with the Wacom settings and am much more happier with my mark making! Thanks so much for the quick video and the time you took to make it. So glad the videos helped. Digital paiinting is a lot closer to traditional painting than one would think. It really isn’t a particular brush but how the artists can use that brush that makes a difference. Keep practicing and make notes about certain marks that are made. Look for those happy accidents and try to repeat them. 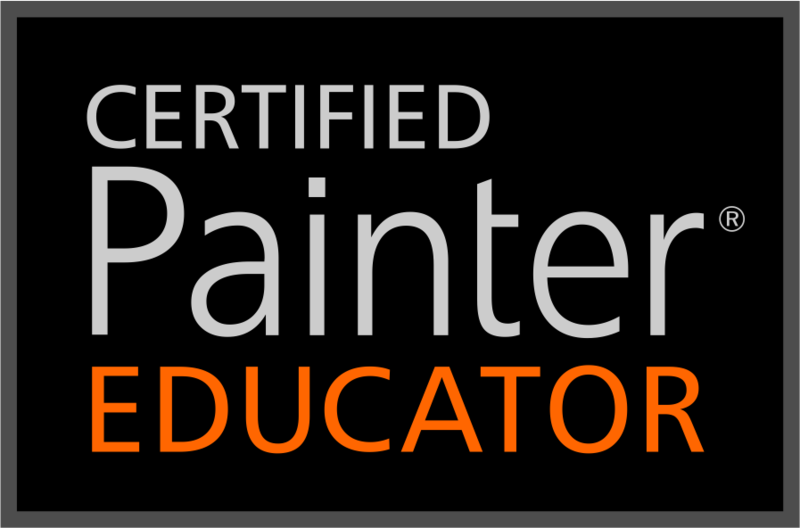 I just finished up the Introduction to Painter 12 Part I class on DAA. I really needed that good foundation and look forward to your brush class in Jan, wish it were sooner, but I understand life happens so I’ll wait. I like your texture brushes especially texture 4 from the cool spring set to lay down multi color backgrounds. I did act on your previous suggestion and tweaked the jitter to rein in how iit laid down on the paper. I found a way to use it on the last exercise. Since I’ll be waiting a while to take your brush course. I need a hint. I have an idea for a painting based on rows of old slate tombstoned from a cemetary up in MA. What would be a good starting point for somthing to lay down fog or mist. I plan on using layers to try and keep things organized so it doesn’t really have to blend. I’m glad you enjoyed Elaina’s class; she is a good teacher. I looked at your comment this morning and off and on today I have tried several things to create mist. I haven’t been very successful…at least with watercolor variants. 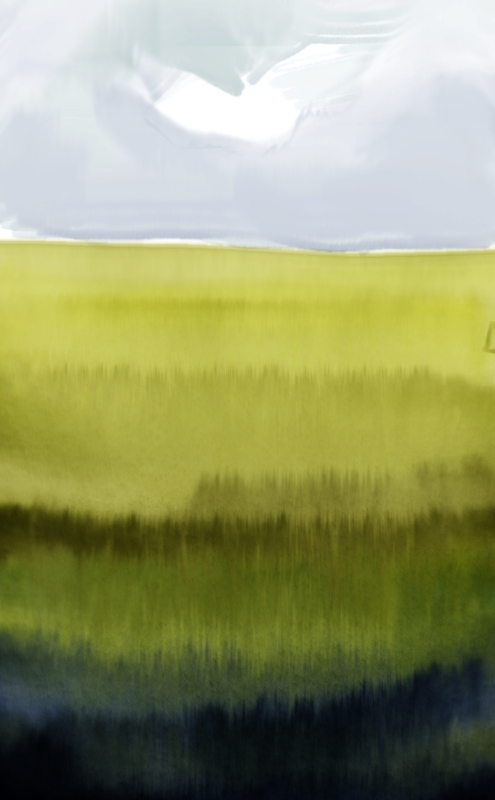 There is a couple of brushes in Eastern Water that are called Mountain Mist and they can give you a hazy look if you paint on the layer above and then play with the opacity slider for the layer. I could probably figure it out with time; something that I don’t have at the moment…sigh. I would much rather play a bit more and figure it out. There is good news, though. You don’t have to stay with watercolor variants. You can try other variants on another layer and then working with either the composite layers and/or opacity slider, you may have better success. I’m glad you are enjoying the brushes. PS: if I think of something, I’ll let you know. I downloaded the cool spring brushes, but I get an xml errore message when I load them in Painter XI on mac os x.
Ho risposto alla tua prima richiesta di aiuto. Io non parlo italiano, ma scoprire che Google Translate fa un buon lavoro. Spero che questo aiuta. Spazzole Spring Cool utilizza una nuova funzionalità che è in Painter 12. Non è retrocompatibile con Painter 11. Vorrei prendere primavera fresca di Painter 12; sarà sempre causare un messaggio di errore. Se si decide di eseguire l’aggiornamento a Painter 12, quindi è possibile utilizzarli. Grazie per aver visitato il mio blog. Vorrei avere buone notizie per voi. sorry, but I didn’t get your first reply. I will try to update painter and will let you know if the brushes will work. I think you will love Painter 12.1. I am really enjoying it. Cool spring works now but can’t see all the kind of brushes you use in the video tutorials, like runny nest rwc-2. I knew you were going to ask that and started to tell you about it in the last note. When I did the Cardinal demonstration, Cool Springs was still in the raw stage…in other words they hadn’t been finished. Once I finished them, I renamed them and made them available for everyone. I wasn’t thinking when I did that. I didn’t realize that folks would not be able to follow the tutorial with the same brushes. Some of them I remember, so if you can’t find a brush that seems to work like the one in the video, please let me know and I’ll see if I can figure it out. Please note, some may be in Drips and Runs. Runny Nest RWC-2 is in Drips and Runs > Drippy 01. I am so sorry for the confusion. Let me know of others that you cannot fine. HI Skip I’m so happy I found this great web site to learn corel painter!!! I was using the cool spring brushes for example fill 01, when i put one color over another resulting dark area in the mixing, is not like you do!! Brushes will be setting before use?? Sorry for the delay in my reply, but I wanted to do a video in response to your question. I have just posted it. I hope it helps. Thanks for your answer Skip!! !, I’m seeing the tutorioales. Thank you very much Skip!!!! for your video and dedication to my question, I’m seeing the tutorial and learning slowly because of language as it costs me a little, but you’ve helped me a lot! I’m glad you are learning from the videos. I wish I could do them in your language.